competing with steel, glass and the footsteps of thousands. rights, rights for all! rights for me and you and them! ebbs and crests with the caws of black, ancient eyes. majestic, grand, eternally situated at the corner of the eye. Filled with pre-run milky tea reflections. with the sea tugging us down. Stay, just a little longer. Rise high with us just a little bit more. along the highway that takes you into the emerald city. Rent a vacation home for a real city experience. Our rental home was cheaper than any hotel and it was well stocked and felt like home every time we came back from a full day of sightseeing. It’s definitely the way we’re going to plan our vacations from now on. Just be sure to shop around a bit to find the best deal and the best location. In amongst the ins and outs, the goings on of every day sightseeing, take breaks. LOTS of breaks. With coffee and preferably a nice sweet bun on the side. Those are the moments that you’ll really remember because life seeps into your skin and you absorb not only the moment, but the day-to-day life of the city. Some of my favorite moments were when we stopped, sipped at a cup and watched life walk by. Be prepared to be surprised. We knew that Seattle was known for being progressive and socially conscious, but we didn’t know just how nice the people would be. Strangers would ask us if we needed directions on the street. Overworked grocery store clerks were efficient and nice as they trusted us when we told them the price of our unscannable cheese. Even bus operators chatted over the intercom about the weather and wished us a great weekend at the end of a Friday! If a city that gets rain 9 months out of the year can still be happy, then why can’t the rest of us? A smile and a friendly face makes life easier, nicer and welcoming. You will eat and you will eat a lot. Be ready to put your diet on a brief hold (unless you have a will of iron) but make sure that you’re still taking every opportunity to exercise and eat only what you’ll not regret. I experienced some of my best runs on vacation as I ran along wide sidewalks, past succulents and mountain skies. I ate some of the best food and while I regret the extra pounds, I don’t regret the wonderful flavors that crossed my tongue. Taste and smell are both critical aspects of memory. When that museum fades into the misty shadows of memory, the joy of sinking teeth into a sweet, chewy bun will not. 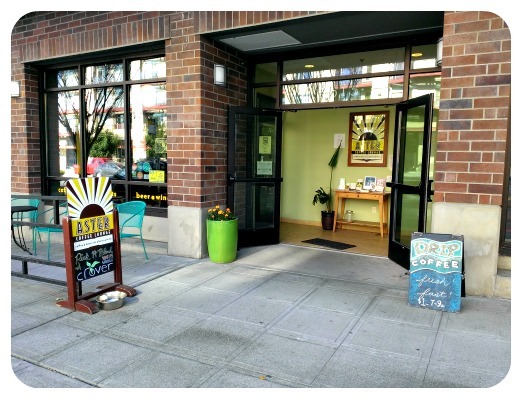 Categories: Life, Vacation | Tags: Photos, Poetry, Seattle, Tips, trip, Vacation | Permalink. 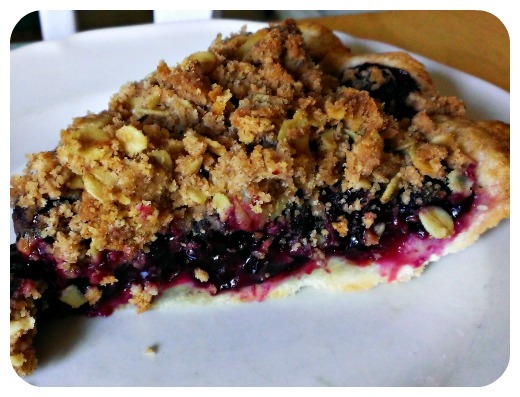 I love pie crust, too, but between that and crumble, the crumble has the rumble to win it all the way! Blueberries are on sale at my area grocery stores and I couldn’t resist buying a few pints. We ate a lot of dessert on our vacation and while it was all delicious (Shari’s Creamy Pecan Pie was voted our table’s most yummy pie and it was all MINE! ), I didn’t really go for many fruity desserts. Sure, there was a wonderful strawberry frosted, vanilla cake with rhubarb compote cupcake from Cupcake Royale. I was also told that the double chocolate vegan cupcake was very good and the salted caramel and chocolate cheesecake cupcakes went down a hit as well (and gobbled up just as quickly!). We definitely lucked out with having the shop a minute down the road from our rental home! So many wonderful cupcakes with just the right amount of frosting and a deliciously dense cake – almost like a dense angelfood in texture. 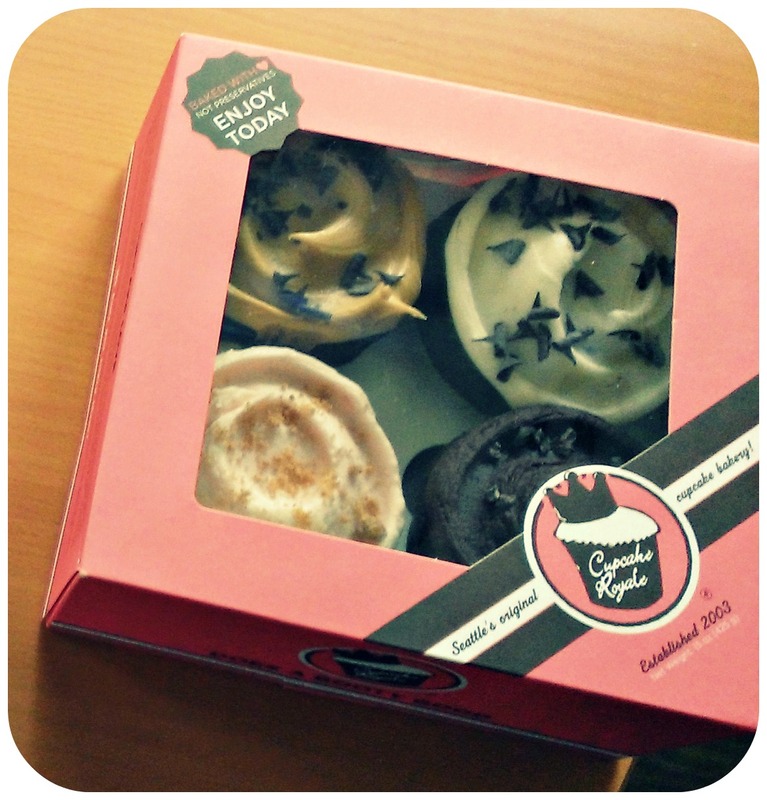 Even though there are a lot of chocolate cupcakes in this box, these were all that were on offer. Not your place to go if you want a wide selection of chocolate cupcakes. There was also the surprisingly delicious white chocolate cheesecake with berry topping from Collin’s Pub in Pioneer Square whose thick crust won my heart and vote. A wonderfully understated cheesecake at a pub that didn’t have a dessert menu and only two desserts on offer. We’re glad we asked our server! 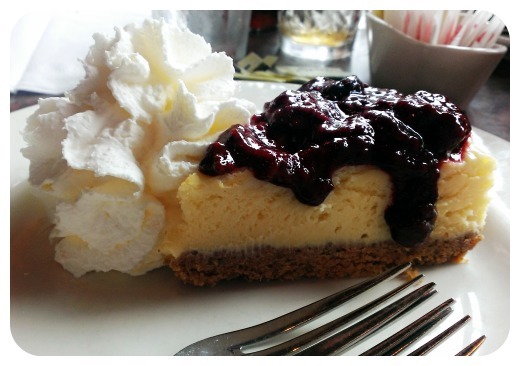 Seattle doesn’t seem to really do dessert menus as much as the midwest, so definitely ask! 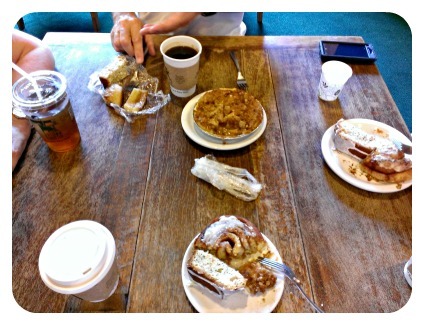 But what we overly indulged in were the cinnamon laden pastries. 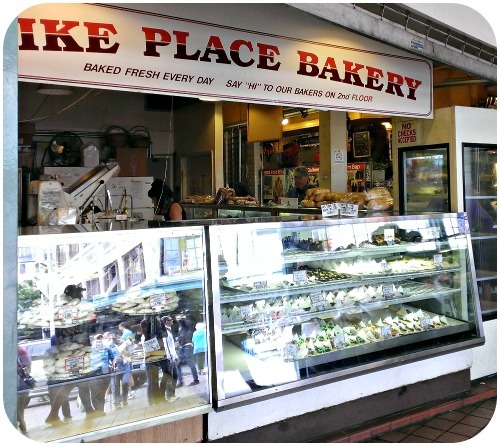 Like the chocolate chip cream cheese topped cinnamon roll from the Pike Place Bakery. The extra large, two palm sized buns were dolloped generously with cream cheese frosting and sprinkled with chocolate chips and curls. We also ate a Bavarian cream horn and an apple fritter from this bakery, but they paled next to the deliciousness of this bun. (In fact, I’d suggest skipping their other desserts since they all tasted like ones you can get at other places like your local grocery – not bad, but nothing fancy.) If we ever go back to the market and brave the crowds again, we’re hitting them up for more of these buns! 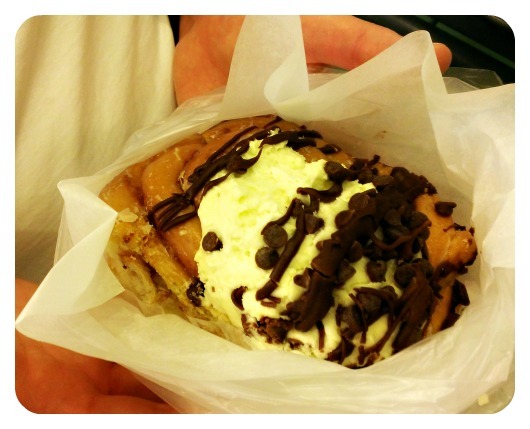 The moist bun wasn’t overwhelmed by the topping at all – perfection! A lot of great looking desserts, but they didn’t all live up to their looks. Be selective here and go for the buns. But I was seriously craving my OWN, home baked dessert and one with fruit. 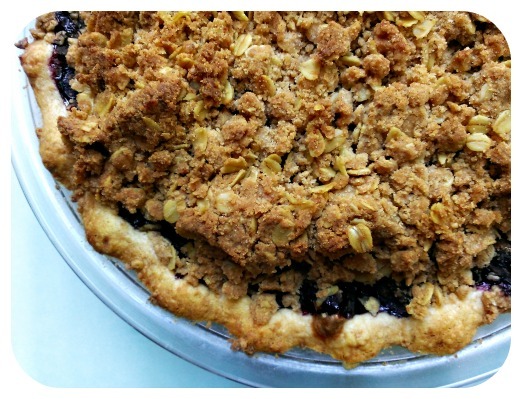 So, when these bright blueberries went on sale, I knew that I wanted to make a pie. We had a wonderful piece of cream pecan pie at Shari’s Cafe and Pie, but while it was decadent and definitely worth indulging in, it wasn’t quite the same as a solid, crunchy, fruity crumble pie. 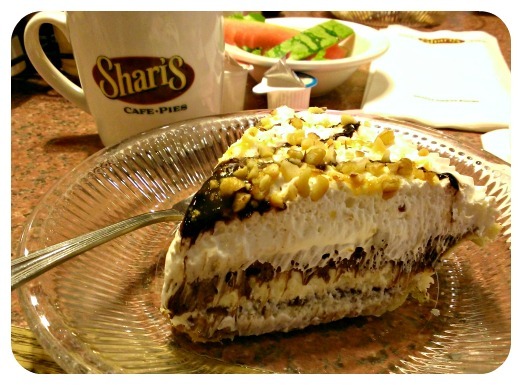 Shari’s Cream Pecan Pie – very delicious, although more cream and less pecan than I would have preferred. There are 4 layers in that pie – pecan pie filling, a dense vanilla cream, chocolate (I think) and the cream topping. Whew! I love me some double crusted pies, sure, but I have a big soft spot for crumble pies. There’s something irresistible about that crunchy, oat topping on a fruit pie that brings out the flavor of the fruit without weighing it down like a crust can. I also like really thick crumble, so I went for big crumbs with a LOT of spice – but not too much spice that it dominated the berries. 1 pie crust either homemade or pre-made. I used a Trader Joe’s pre-made crust with great success. To make the crumble: Mix all dry ingredeints in a medium bowl. Using a grater, grate butter into bowl and mix with fingers until big crumbs form. Set aside. To make the filling: Rinse berries, pick any stems and set aside. Mix dry filling ingredients in a plastic bag and reserve 1 tbsp for later. Sprinkle rest of mixture over rinsed berries until coated. Press crust into 9 inch pie pan and sprinkle reserved mixture over crust. Fill with coated berries (it might mound a bit, but that’s okay!). Top with crumble and press down gently (don’t squish the berries but press to keep the crumble in place). Place in preheated 375 F oven and bake for 50 – 60 minutes or until golden brown. Cool completely on a wire rack and serve at room temperature. Categories: Recipes, Review, Vacation | Tags: baking, dessert, Pie, Seattle, trip, Vacation | Permalink. Seattle is full of character. The massive sprawl of the city has created distinctive “neighborhoods” where people express themselves freely and with abandon. Just walk down any street on Capitol Hill and you’ll easily see abundant displays of personal expression in the piercings and elaborate tattoos. Go for a jog in West Seattle and you’ll want to wear either a sundress with big sunglasses or a pair of yoga pants to shop for groceries. Personal choice and freedom of expression seem to be a way of life in Seattle and you’re just as likely to order a burger from a waitress who looks as if she’s ready for a glamorous night on the town as you are to order a coffee from a heavily tattooed barista. We had a lot of time to people-watch while in Seattle. No excursion would be complete without at least two stops at coffee shops to have a mocha and a bun. With every sip we sat back, rested our tired feet and watched as people sauntered past us on their way to home? To work? To a date? Back home, there’s little people-watching unless you are at a Starbucks in a mall or taking a break with an icee at your grocery. Any watching one might do is confined to an enclosed space. There are few streets where you can sit nursing a drink and watch as the world walks by to destinations and experiences unknown. The fact that everyone drives everywhere is, of course, partly to blame, but it’s also how we define “getting a coffee”. Rather than an event where you meet up with friends or kick back with a newspaper or a book, it’s more of a chore that happens at the drive thru on your way to work. It’s not about the experience of coffee drinking but more about getting the beverage with the caffeine as conveniently as possible on your way to something else. 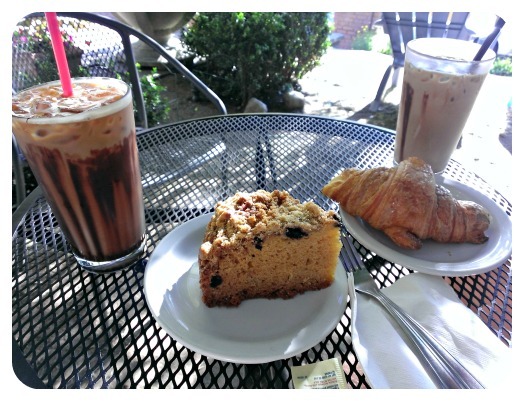 But as I kicked my feet up in a cozy coffee house and geared myself for the next item on our overly enthusiastic itinerary, I noticed something odd. For a city with so much personality, I felt a bit, well, bland. My clothes didn’t feel distinctive enough in their jean short and t-shirt combination and my simple bobbed hair and lack of makeup made me feel rather inconspicuous next to the well-coiffed, ruby red women around me. Back home, I would have been almost unique (in a slightly preppy sort of way), but here, I didn’t stand out enough to warrant a blip on anyone’s fashion radar. Even those that didn’t seem to try to be fashionable still managed it in their sundresses and nonchalant style. Grant it, I have always found pairing clothes to be a trial by error exercise with more time spent discarding clothes and frantically searching for “something to wear”. Style has never come easily to me and I’ve always been one step behind everyone else. I take just a bit too long to gather up my confidence to wear the latest style so that when I’m finally ready, the world has moved on and it’s back to square one. So, I found it odd that in a city where I should have felt at ease in my own skin, I felt, well, boring. Even my plain skim milk mocha wasn’t as fashionable as the drinks my coffee drinking compatriots around me were probably sipping as they typed away on their laptops! I remember looking at my barista with a sideways glance of distrust when she asked me if I wanted a “spicy” mocha. “What does that entail?” I asked her, as if she was planning to spike my drink. Apparently, spicy entailed milk infused with red pepper flakes. I declined and carried my drink back to my table cradled in both hands. Perhaps it wasn’t the city that was making me feel dull. The more I sat watching people, the more I reflected on myself. Each person was like a mirror where I compared myself to them – that person looks a bit extravagant with their coal rimmed eyes, so my natural eyes must look really plain. Or that person looks really confident in that tight bright blue mini dress – I wish I had that much confidence to pull it off! In a way, while all of that comparison watching didn’t always make me feel good about myself, I did come to realize that I actually liked being me. I knew where I was with my jean shorts and t-shirts. I knew what to expect when I picked up my mocha and took a sip of it’s milky chocolate. I was, in a way, comfortable in my own skin and with my own habits. And while I might have wished I was more outgoing or more of a risk-taker (I sort of regret not taking her up on that spicy mocha), I knew that in that small way, I was also unique. 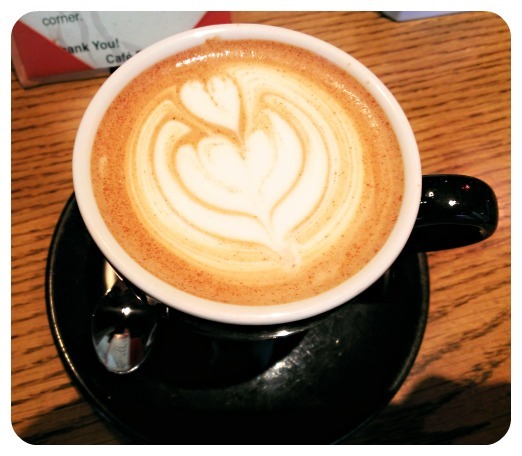 Categories: Life, Vacation | Tags: life, Musings, Seattle, self image, trip, Vacation | Permalink.